If the wooden floors in your home are looking worn and tired, then call AJ Floor Sanding in to give them a makeover. 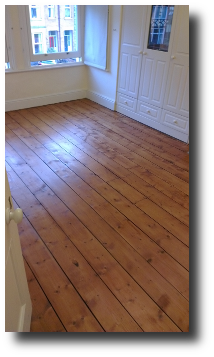 Whether you have a pine, parquet or any other type of wooden floor, AJ Floor Sanding will restore your floor to it’s former glory – this alone can transform the look of your room. We are a family business and value our reputation for being a reliable, honest and affordable floor sanding service provider in Evesham and the surrounding areas. FAQ #1: What about dust when sanding my floor – will there be any? Our sanding machines pick up 98% of the dust, so we achieve a virtually dust free floor sanding service. There won’t be any huge clouds of dust, so no need to worry about that. Any dust that isn’t captured by our sanding machine, will be cleaned with our vacuum as part of our vigourous clean-up procedure. FAQ #2: How long does it take? An average size domestic room can usually be sanded and resealed in 1 day. If there is any additional work to carry out such as gap filling or wood staining, then this will normally take 2 days. Larger rooms, or where there are multiple areas such as hallways and dining rooms, then the floor sanding process will normally take 2 days. FAQ #3: Couldn’t I just hire floor sanding equipment and do it myself? Whilst floor sanding equipment can be hired, it is generally of an inferior quality to the machines we use. We would advise not to do it yourself unless you really know what you’re doing. A sander in the wrong hands could leave your floor permanently damaged. It takes years of experience to achieve the perfect finish when floor sanding – AJ Floor Sanding have over 30 years of floor sanding experience so let us do it for you. Take a look at our recent work on our gallery page here. We welcome enquiries for all types of domestic floor sanding requirements. Our diary fills up fast, so if you’re looking for a quality floor sanding company to service your floor, please complete the online form on this page or call us using the number below.